Do you ever get the craving for comfort food in the summer? There are times when flavored ice is just not enough. There are times that call for something creamier, denser and more filling that a typical ice cream. That's when it's time to pull out the big guns and make custard. I admit that I do try to be somewhat cognizant of the types of foods I'm eating, the amount of fat in the meals and how much exercise I get. But look at it this way, this is a summer comfort food. In winter we get chili and pastas and stews- nice hearty foods. But those don't play nice with 90 degree heat. Custard, however, does! Make a statement today and make custard! You will truly be fat and happy! Add the cream, vanilla bean, milk and pinch of salt in a pot. For the vanilla bean, you will need to split the bean in half and scrape out the paste-like inside. Add this to the milk along with the bean casings. Bring just to below a boil and whisk in the mascarpone. Turn off heat, place a cover on and let steep for about 15 minutes. Then whisk together the yolks and sugar until the yolks turn a fluffy pale yellow (this is going take about 5 or 6 minutes, just keep whisking! Remember your're building muscle!) Now, temper the eggs by add a cup of the warm cream to the eggs, one at a time. You're bringing the eggs up the the temperature of the cream slowly to avoid scrambling the eggs. Once you've tempered the eggs, add them to the pot and turn the heat on to medium low. Stir until the the liquid starts to thicken and coats the back of a wooden spoon (if you run your finger across the back of a spoon you can see a line drawn through the custard.) Do not boil though. Remove the vanilla bean casing and either discard or save to use for other purposes. Place the cream in bowl or simply use the pan its in and and then place that in a larger bowl of ice and water to cool. If you need to make the ice cream immediately, add it to your ice cream machine and follow the manufacturers instructions. If you can wait a day, place the custard mixture in the refrigerator for the night, and then continue with your ice cream machine after that, using the manufacturers directions. 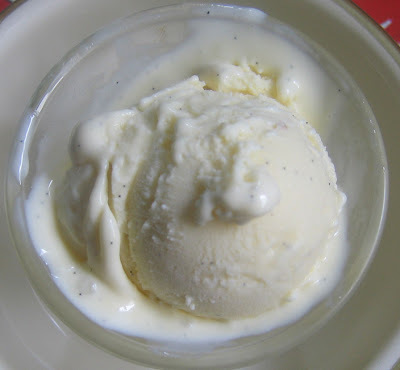 Allowing the cream mixture to sit overnight helps the ice cream to become slightly smoother and creamier! Enjoy!